Ok, so first off, I do have to say that I DO and DON'T recommend this edit, but hear me out. Now, as for the bigger change here: The soundtrack. This is where I don;t recommend this edit... I would say maybe half of it worked kinda mostly, while the other half felt out of place and some tracks felt too were familiar. Suffice to say, I wasn't a fan of the new Vangelis soundtrack. 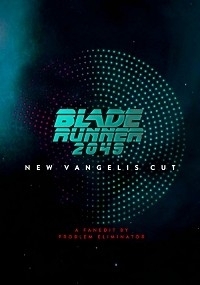 I think maybe the Vangelis should stay with the original Blade Runner where it felt appropriate. This movie is 30 years later, and should have a fitting soundtrack that feels new, not a throwback soundtrack. When I got this edit, I thought for sure that I would be enamored by a Vangelis soundtrack, but I just wasn't. It doesn't feel right to me. Anyways, soundtrack aside, the editing is technically perfect from my perspective. I don't know what magic was used to replace the soundtrack, but it was mixed in there well. As for the narrative and editing, I found zero issues. Honestly, if I could have THIS edit with the ORIGINAL BR2049 soundtrack, that would be fantastic.